The global push to smaller cars increasingly fosters conflicts between lightweighting versus crashworthiness. Meeting vehicle requirements for smaller, lighter bodies without compromising occupant safety is refocusing the energy and efforts of auto-industry OEMs and their suppliers as new lightweight materials and disruptive processes appear regularly. However, innovation and ingenuity are not the whole story. Equally critical is time—time to place new products into production, and the cycle time of production itself. “In the years I worked at an auto OEM, the allowable time to develop a new model was compressed from three years to 12 to 14 months,” explains Ulf Wigren, tooling and simulation department product manager at Sweden-based AP&T Group. As a developer of metalforming systems, die sets, tooling and hydraulic presses, AP&T is on the front lines in the battle to ever more quickly develop automotive models. One major AP&T Group challenge lies in placing hot-formed dies into production in customers’ plants within shrinking timeframes. Not long ago, manufacturing engineers, systems designers and tooling providers needed a year or more to engineer, build, test and install a new production system. Today, AP&T finds normal delivery time for a hot-forming die set to be approximately 25 weeks. AP&T notes that some so-called “crash parts” in new small cars can only be produced with the complex hot-forming process and that simulation is essential at every step in developing the production systems. When building die sets for its metalforming systems, AP&T uses simulations and analyses done with ESI Group’s Pam-Stamp virtual-prototyping software to overcome design challenges and provide tooling on a schedule that the OEMs demand. Simulation of this automotive B-pillar indicates material thinning after forming. The hot-forming process is intricate and demands special attention. Simulation allows multiple variables to be tested in hours, minimizing tool-design time and costs. This illustration depicts the complex hot forming of B-pillars, utilizing a tailored blank, spacers, guides and several pads. • Complexity. As many crash parts combine several simple sheetmetal parts into one component, these redesigns reduce fabrication, welding and subassembly tasks as well as the production cycle time they consume. Some sections of these parts are rigid to protect vehicle occupants in a crash while other sections are ductile to absorb crash energy. In summary, crash parts can be extremely complex. AP&T uses Pam-Stamp to model crash parts, such as the steel uprights (B-pillars) located between vehicle doors, and which join the body and roof. • Fabrication difficulties. The automotive industry sees increasing use of advanced high-strength steels (AHSS) and ultra-high-strength steels (UHSS). These new steels are far stronger than mild steels used for most sheetmetal body components but often experience cracking, wrinkled surfaces, thin or weak spots, and springback during conventional blanking, stamping and forming operations. Hot forming solves these problems, with near-net-shape parts dimensionally stable and free of distortion and defects. In automotive operations, hot forming is a relatively new production innovation with challenges of its own. To address them, AP&T has built a dedicated press line for hot-forming research and development. A typical hot-forming cycle time can be 12 sec. or less for thin parts. Quenching time within the cycle is short enough to allow for the austenite-to-martensite transition in the steel microstructure. The parts have no market if they cannot be hot formed that quickly in full production, explains Harald Porzner, director of product management for ESI Group’s Virtual Manufacturing line. 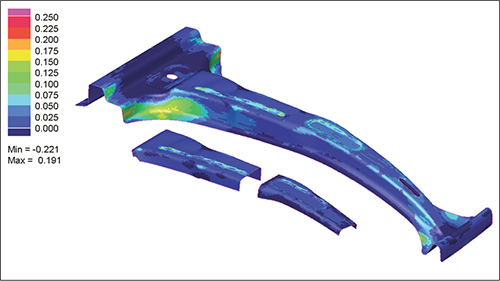 To ensure that customers receive ideal hot-formed parts, AP&T employs Pam-Stamp simulations and analyses. Simulations, from part design to production, can be set up in minutes and dozens of tests can be run in a day with simulation results available in minutes, according to ESI Group officials. The alternative to simulation—physical testing—is far too slow for AP&T. Setting up and performing a physical test may take two or three days plus another day or two to analyze the results. Quenching ensures that the steel’s microstructure provides ductility in certain areas of the part and rigidity in others. Ductility helps absorb crash impact energy while rigidity helps the component resist collapse during a collision. In AP&T systems, hot-formed parts are quenched while still in production die sets, which requires designing the dies for rapid water-cooling. For austenite-martensite transformations, the rate of cooling is critical. 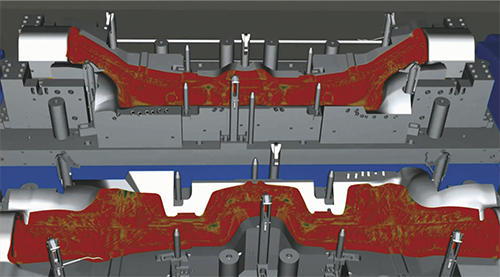 Quenching newly formed parts in the forming dies requires three sets of analyses with Pam-Stamp, Wigren explains. Inside of the dies, channels carry water to absorb the heat produced during forming, when temperatures can reach 450 C in just a few seconds. A third set of simulations verifies that the entire quenching process will meet customer requirements for physical properties and production time. In high-production, short-cycle-time manufacturing, functionality and appearance must be balanced against manufacturability and cost. The ability to accurately simulate and analyze a process is vital to optimizing the necessary tradeoffs envisioned in customers’ designs. That is certainly true for AP&T. As a provider of systems and tools, AP&T also guarantees part dimensions, mechanical properties, crashworthiness, regulatory compliance and conformance to industry standards. This guarantee makes customer buy-in vitally important, for which AP&T uses ESI’s virtual-reality product, IC.IDO. Virtual-reality technologies such as this connect the digital and physical realms, where parts and processes become animated, 3D representations. Article provided by ESI Group North America, Farmington Hills, MI; 248/381-8040; www.esi-group.com. See also: ESI North America, AP&T North America Inc.
We’re an hotforming tool maker with almost 20 years experiences. We currently supply our dies everywhere in the world, USA included. Please, contact us if you’re interests in business.